Jack Daniel's is the most popular brand of whiskey in the world. The Jack Daniel's Distillery located in Lynchburg, Tennessee produces 11 brands, labels and variations of Tennessee Whiskey or other North American whiskey. Jack Daniel's brands are owned by Brown-Forman Corporation, headquartered in Louisville, Kentucky. The founder of Jack Daniel's was Jasper Newton "Jack" Daniel (1848-1911) and according to the distillery he was born in 1850, but they say his exact birthday is unknown. Other historians claim that Jack was born in 1848 since his mother passed away in 1849. The company website says it is customary to celebrate his birthday on September 5th. Jack's lineage was Scotch-Irish and Scottish which stems from Northern Ireland and Scotland since his grandfather Joseph "Job" Daniel and his grandmother Elizabeth "Bettie" Calaway emigrated to the United States from those countries respectively. Jack's father Calaway Daniel who was born in New Bern, North Carolina had a total of 12 children and Jack was the youngest of his mother Lucinda Cook Daniel's eleven kids. Calaway remarried Matilda Van Zandt and they had one more child. Calaway Daniel died in December of 1863 as a result of pneumonia caught while serving as a soldier for the Confederate States of America during the U. S. Civil War. Jack despised his step-mother Matilda, and as a result, he ran away from home and was essentially orphaned at the young age of fifteen. The front entrance to the "Jack Daniel's Distillery" in Lynchburg, Tennessee. As a teenager, Daniel was taken in by a local pious Lutheran Minister and moonshine distiller named Reverend Daniel Call and he began learning the distilling trade from him. Within three years around 1866, Jack became a full partner in the small distillery at the Call farm off Louse Creek. In 1875, upon receiving an inheritance from his father's estate following a long dispute with what was left of his siblings, Jack founded and legally registered a whiskey distillery with Call. He took over the distillery shortly afterward when Call was forced to quit by his wife and Congregation for religious reasons. He was given the choice between Whiskey and Religion and chose god. At that facility, Jack learned the everyday operational tasks and the tricks of the trade from an enslaved African American named Nathan "Nearest Green" (1840-1890). Nearest essentially served as "Master Distiller" for the distillery and remained working for Jack even after emancipation at the conclusion of the Civil War. On the bottle itself the label says "Est. & Reg., in 1866," but Daniel's biographer has cited official documents that say the business was not registered until Jack's inheritance in 1875 but that Jack knew the older the distillery was, the more people would trust his product's quality. So he continued using the 1966 date since there were no laws in place to restrict such use. After taking over the distillery completely in 1884, Jack purchased the hollow and land where the distillery is now located about five miles from where Jack was born. There is an underwater spring runs throughout the property and even under the distillery. The cave goes back into a hillside about a mile and cuts through layers of limestone, keeping the water at a cool 56 degrees year-round. The limestone-filtered water is the most important feature of all Jack Daniel’s whiskies. It not only removes unfriendly iron from the water, but also adds calcium and magnesium. That Cave Spring has actually been listed as South Central Tennessee's most important natural resource by Forbes Magazine in 2008. Some of the Administration and Staff of Whiskey University are shown above posing with Jack Daniel in front of the entrance to the “Spring at Stillhouse Hollow” at the Jack Daniel’s Distillery. Pictured (from left to right) are; Casey Williams, Dax Russell, Josh McCrory, Troy Rubert, Professor Colonel Craig Duncan, Master Distiller Jack Daniel, Scott Jackson, Scott Wauford, Professor Lt. Colonel Carl Ingrum, Professor Lt. Colonel Dale Robinson and Dakota Mercer. Jack began using a square shaped bottle in 1897, the shape that Jack said intended to convey a sense of fairness and integrity. More importantly, it distinguished his bottles from everyone elses’ bottle on the market. When you are unique you are easy to find. 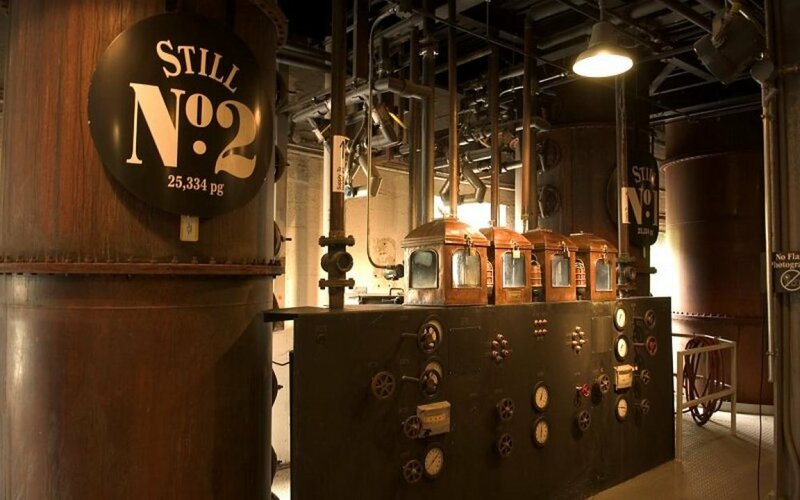 The distillery will tell you that the origin of the "Old No. 7" brand name was because it was the 7th Recipe that Jack had tried, and apparently, the one that he liked best. But in reality, the number was assigned to Jack's distillery for their government registration in which he was the No. 7 distillery in district 4 of the U. S. At one point He was forced to change the registration number when the federal government redrew the district lines and he became No. 16 in district 5, instead of his original number seven. However, he continued to use his first distillery designation as the brand name in "Old No. 7," since his brand and reputation already had been established using that description. Jack Daniel's experienced a huge surge in popularity around the country after the whiskey received the Gold Medal for the finest whiskey at the 1904 World's Fair in St. Louis, Missouri. At that same time, Jack Daniel's local reputation in Tennessee was suffering because the temperance movement was sweeping the state. That gold medal would be the first of seven that the brand would go on to earn. Four ricks of Sugar Maple Charcoal being burned under the hood to ship over to the distillery. Jack Daniel never married and did not have any children. In order to continue his success, Jack brought in his two nephews from his sister Finetta Josephine "Josie" Daniel Motlow and her husband Felix "Stump" Motlow to help run the place. Josie was only a year older than Jack and was by far his closest sibling. His nephews Lemuel Oscar "Lem" Motlow (1869–1947) would run the business side of the distillery while Jesse Butler "Jess" Motlow (1897-1957) ran the production or distilling side of things, both under Jack's guidance. Lem was skilled with numbers and was soon doing all of the distillery's bookkeeping and accounting. In 1907, due to failing health, Jack Daniel gave the distillery to those two of his nephews. Lem soon bought out Jess's shares out and went on to operate the distillery for about 40 years. He went on and named his brother Jess Motlow the company's second Master Distiller in 1907. This was a job he did well for 33 years and would hold until 1941. Tennessee passed a statewide prohibition law in 1910. This effectively barred the legal distillation of whiskey within the state. Lem Motlow challenged the law in the Tennessee Supreme Court but the court upheld the law as constitutional. Jack died in 1911 from blood poisoning. The distillery claims that an infection began in one of his toes, which Daniel injured one early morning at the distillery’s office when he kicked the safe in anger when he could not get it open. It is said that Jack always had trouble remembering the combination to that safe. Because of the prohibition laws in force in Tennessee, Lem Motlow and the company moved all of its stored barrels of whiskey to St. Louis, Missouri and Birmingham, Alabama where they also began distilling. None of the whiskey produced from either of these locations was ever sold due to quality problems. Those operations like the one in Tennessee before them, were also halted following the onset of nationwide prohibition following passage of the Eighteenth Amendment in 1920. While the passage of the Twenty-first Amendment in December of 1933 repealed prohibition at the federal level, state prohibition laws in Tennessee remained in effect. It prevented the Lynchburg distillery from reopening. Motlow, who had become a Tennessee State Senator, led efforts in the state assembly to repeal these laws. He and others succeeded allowing production to restart at the distillery in 1938. Ten foot deep vats of Sugar Maple Charcoal are used as part of "Lincoln County Process" to filter Jack Daniel's. It is this step that differentiates Tennessee Whiskey from Bourbon. The five-year gap between the national repeal of prohibition and Tennessee repeal was commemorated in 2008 with a two bottle gift pack, one for the 75th anniversary of the end of National prohibition and a second commemorating the 70th anniversary of the Tennessee repeal and the reopening of the distillery. In 1941 the company appointed Lemuel "Big Hide" Tolley (1898-1980) as only their third "Master Distiller" in history a position he held until 1964. In 1926 the company was incorporated as "Jack Daniel Distillery, Lem Motlow, Prop., Inc." This has allowed the company to continue to include Lem Motlow, who died in 1947, in all its marketing, since mentioning Lem in the advertising was technically just citing the full corporate name of the company. In 1941, Lem Tolley commissions a life size statue of Jack Daniel exactly to scale in bronze. It stands five foot, two inches with a shoe size of seven and was placed right in front of the Cave Spring Hollow's entrance. The Jack Daniel's distillery ceased operations from 1942 to 1946 when the U.S. government severely limited the manufacture of whiskey due to World War II. Lem Motlow and Tolley resumed production of Jack Daniel's a few years later in 1947 after good quality corn began to become available. Motlow died the same year. Big Hide Tolley (nicknamed that because of his tall and rough stature) worked to try and keep up with the demand for Daniel's Tennessee Sippin' Whiskey. He was Jack's grand-nephew and was ultra committed to keeping all of Jack's traditions and recipe alive. He published Ads in many newspapers, A special message to the valued friends of Jack Daniel's. "We'd rather ask your patience than lose your respect for Jack Daniel's Whiskey." Lem Motlow left the ownership of the distillery to his children, Robert, Reagor, Dan, Conner, and Mary, upon his death without leaving any piece to Tolley himself. The distillery has five Column stills that are capable of producing 25,334 proof gallons per day. In 1947 Jackie Gleason of "The Honeymooners" introduces Jack Daniel's to Frank Sinatra in a bar in a New York City bar. It's an instant hit, Frank took Jack everywhere he went, on tour, on his private jet, at award ceremonies and even live on stage. In 1947 Jack Daniel's was selling about 200,000 cases a year. In 1955 on a TV broadcast of The Frank Sinatra Show on ABC, he picks a high ball of Jack up off a stool and the base of his mic stand right after singing a song and proclaims it, "the nectar of the gods and the best booze in the world.” Sales of Old No. 7 skyrocketed and a little over a year later by 1957 the company was selling over a million cases a year. Frank Sinatra died in 1998 and was buried with a flask of Jack Daniel's inside his left jacket pocket next to his heart. The company was sold to the Brown-Forman Corporation of Louisville, Kentucky in 1956 by Lem's children. Before leaving the business Reagor Motlow hired Jess Campbell at the late age of 47 to be Tolley's assistant. After sixteen years at the distillery, Brown-Forman rewarded the Campbell with the promotion of being the fourth Master Distiller in Jack Daniel's history at age 63. Jess was the first non-family member, the first non-Lynchburgian and the first non-drinker to run the plant. Since he retired at age 65 he served only two and a half years in the top spot. In 1966, Brown-Forman appointed a distant Daniel/Motlow relative Frank "Frog" Bobo as Jack Daniel's fifth Master Distiller. Offered a job at the family distillery in his twenties in 1957, Bobo continued on as the Master Distiller until 1988. Bobo guided the company through tremendous growth and increased the capacity at distillery by growing from two stills to five, that were now operating seven days a week. In 1988, the corporation promoted James Howard "Jimmy" Bedford (1940-2009), a long time employee of twenty years and local farmer to be the sixth Master Distiller at Jack Daniel's. It was also in 1988 with the help of the Senior Master Distiller at Brown-Forman, Lincoln Henderson, that Bedford released "Gentleman Jack," a Double Mellowed slightly older Small Batch Whiskey. This was Jack Daniel's first brand released since the original "Old No. 7" over 120 years ago. It hit the streets with astounding success. In 1997 Bedford and Henderson teamed up again to release "Jack Daniel's Single Barrel," the first "Top Shelf" iteration ever released by the distillery at an unheard of $45.00 a bottle (750ml). In 2008, Jack Daniel's appointed its seventh Master Distiller in Jeff Arnett (1978-present) a Jackson, Tennessee native after working at the distillery for seven years. In 2011 the distillery released its fourth brand and first flavored whiskey in "Tennessee Honey." In 2013 the organization released "WinterJack Tennessee Cider." Arnett promoted Chris Fletcher, Frank Bobo's grandson to both Apprentice Master Distiller and Master Taster in 2014. 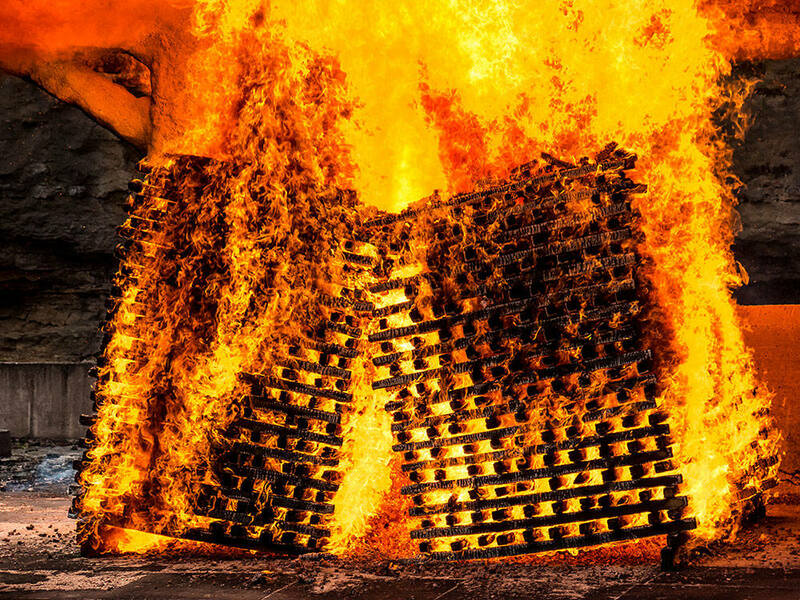 In 2015 Jack Daniel's releases a new brand called "Jack Daniel’s Tennessee Fire." In 2016 Jack Daniel's releases its first non-corn based distillate in over 150 years in "Jack Daniel’s Single Barrel Rye" and invested over $140 million to construct two new barrel houses. Jack Daniel’s produces over 65 different Bottles. 32 Legacy and Commemorative bottles and 36 Limited and Special Edition bottles but only has 11 Brands. What’s inside most of the fancy bottles is all the same Jack Daniel's. They are using the same product of Jack Daniel’s Old No. 7 at 80 Proof or the same recipe at 86 Proof. In Reality, Jack Daniel’s ONLY Has two main mash bills (recipes) making seven versions of whiskey and three flavored whiskies.